Does anyone remember that episode of Drake and Josh where they built a treehouse around them and forgot to cut out a door? Well that basically just happened in real life, except with a fence and a van. The unfortunate incident is thought to have taken place in the Cheetham Hill area of Manchester last week, when two workmen were tasked with putting up the fence around a house. I’ve never done it myself, but I’m sure there’s a lot of planning that goes into putting up a fence. You need to do some measuring, probably put in some foundations so it doesn’t fall down, and just generally ensure the fence will create a successful, clear boundary. I think these workmen achieved all of those things. They certainly created an excellent boundary between their van and their route home. 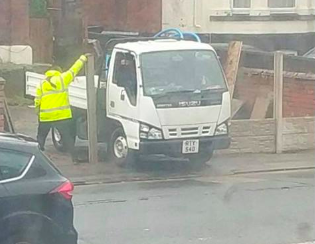 The workers parked their van on the driveway they were working on, probably seeing it as an efficient spot where they could easily access their materials and not realising the issues involved. They got to work putting in the posts and slotting in the concrete panels, and actually made it through quite a lot of the task before realising the comedy sketch-like situation they’d put themselves in. 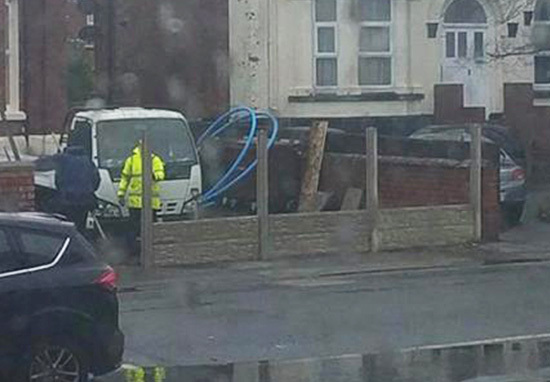 The funny scene was caught on camera by Col Condron, who shared pictures of one of the workmen looking despairingly at the van which had become trapped behind the new fence. Trying desperately to amend the situation, one of the men began to push and pull at the fence posts until there was enough space between them to gradually free the van from the self-made trap. They parked the van, built the fence, and forgot the van was there. It took them about half an hour to get it out. They had to take the fence apart again, and then pull the fence posts back in the wet concrete. They got the van out and put it all back together again. 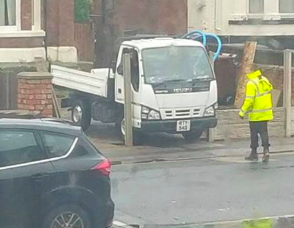 I suppose it could have been worse; they could have finished the job entirely, packed up the van and started the engine with the satisfaction of a job well done, only to realise there was a fence in front of them. That would have been devastating. I think at that point you’d just accept the van was lost forever and set off on your walk home in defeat. While the homeowner might have had some doubts about the common sense of the workers they’d hired, at least they can be confident they’d built a good, protective fence. It’s an easy mistake to make, as Drake and Josh taught us.